An nou alé! – Annette Joseph-Gabriel, Ph.D.
An nou alé! is an interactive language textbook that introduces the English-speaking learner to Martinican Creole. 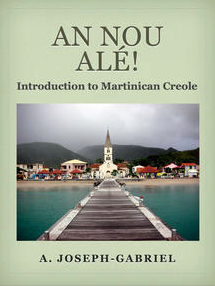 It combines touchscreen technology with a communicative language approach to provide an engaging and easy-to-grasp introduction to the language, history and culture of Martinique. Each mini-chapter is organized around specific language functions such as greeting and leave-taking. The learner can take advantage of the multimedia features such as video and audio recordings, as well as interactive exercises, in order to gain a basic understanding of patterns of pronunciation and tense-formation in this French-based Creole. It is available here.